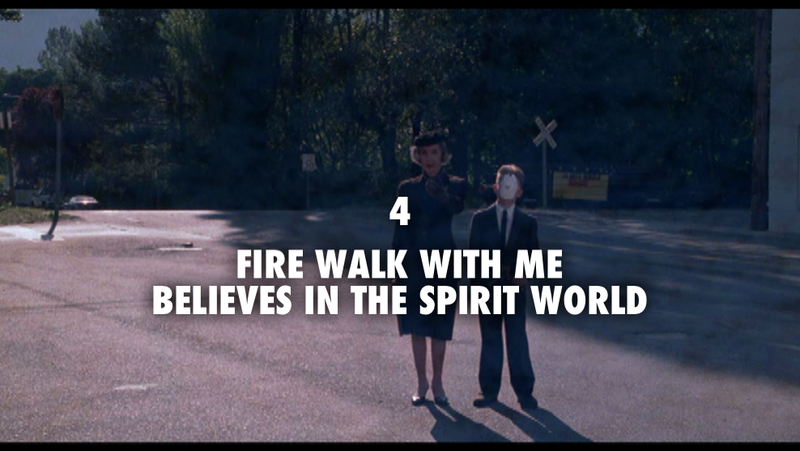 And now we (begin to) reach my favorite part of Twin Peaks, and also one of the most troubled and controversial: Fire Walk With Me, the 1992 prequel film by David Lynch. Although the film's reputation has improved since its disastrous reception two decades ago, it remains greatly misunderstood and underappreciated. I explore the context for positive and negative opinion in the following video (an excerpt from the upcoming Part 4 of Journey Through Twin Peaks, it can still be watched on its own). There are obviously many other details that could be pointed out: the film's structural messiness, the difficulty getting Kyle MacLachlan to do more than a cameo, the hour and a half of deleted footage. But these will be addressed in upcoming chapters and did not seem as integral to me as these seven fundamental facts. 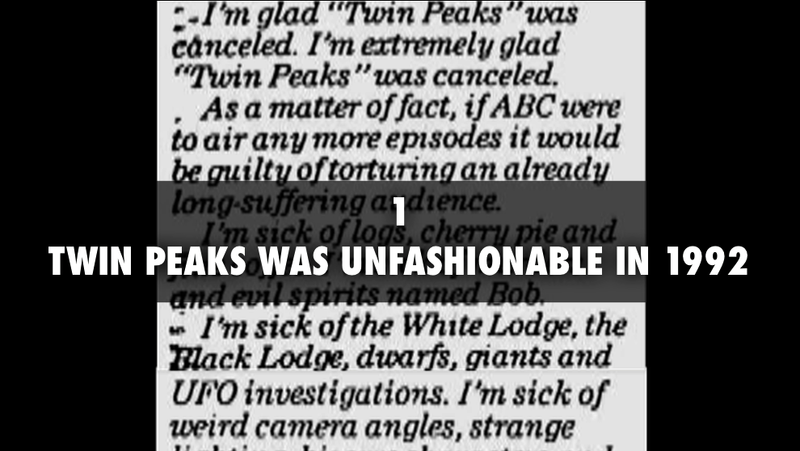 While some of these statements can seem more like opinions - how do we "prove" that Fire Walk With Me fulfills Twin Peaks? - they remain solidly rooted in visual and/or historical evidence which I present onscreen. Needless to say, there are spoilers and graphic/disturbing content. The video is presented below, alongside screen-caps of each of the seven facts for easy reference. Happy New Year - see you in 2015. Meanwhile, if you are new to Journey Through Twin Peaks you can watch Part 1 (Harmony of the Dark Woods), Part 2 (The Center Cannot Hold), and Part 3 (The Whole Damned Town). You can also start directly with Chapter 1 on YouTube. Awesome. The contradiction between what Lynch was interested in as opposed to Twin Peaks is so telling. He wanted to explore Laura's world, yet a lot of us (including me at the time) weren't as willing to follow him there. One thing I love about Lynch is that he follows his instincts - and they usually prove correct even if it takes a while to realize it. On the other hand, I like that he incorporates rather than ignores obstacles and outside circumstances. One thing that never ceases to amaze me is that if Lynch TRULY had his way - delaying the killer's reveal for a long time or even not revealing him - we never would have had Fire Walk With Me. Obviously the film means a great deal to him, yet he continues to claim the killer's reveal was a huge mistake and is painful to him. I can kind of see how he squares that circle but it's hard for me to wrap my head around. 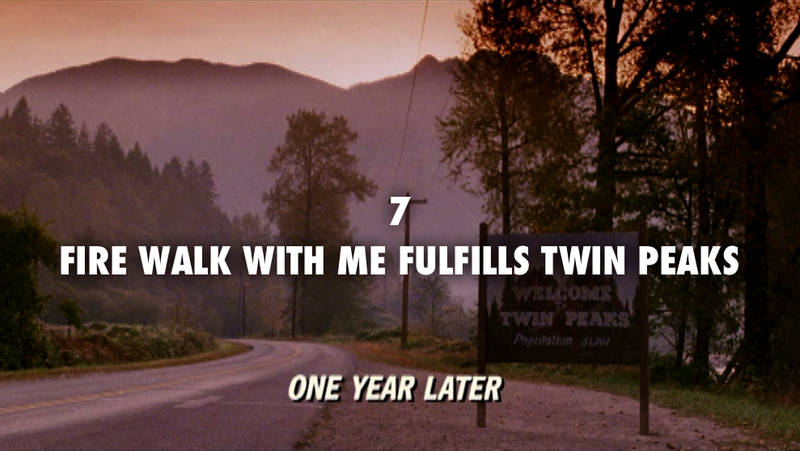 Personally, I would rather have episode 14, episode 29, and especially Fire Walk With Me than seven excellent seasons of the Laura Palmer mystery, good as I'm sure those would have been. The fact that Lynch threw himself so heavily into parts of Twin Peaks he opposed (revealing the killer, Cooper's failure) suggests that deep down on some level he knew that they worked. After all he did not involve himself deeply with a lot of other Twin Peaks storylines. I think in a way there were two Lynchs working on Twin Peaks (how appropriate): one in love with mystery, and one in love with the truth. The first had his hand forced, and the second emerged to the benefit of Lynch's subsequent work, not just on the show. 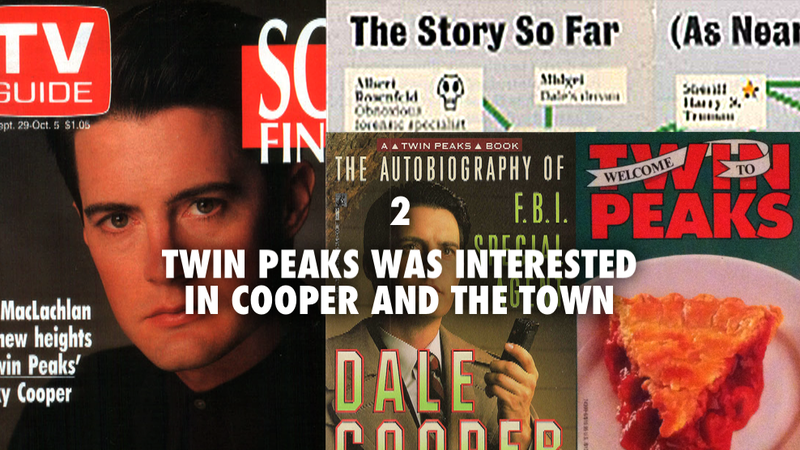 Lost Highway, Mulholland Drive, and Inland Empire are pretty difficult to imagine without the Leland/Bob reveal, Cooper's split in the Lodge, and Laura's personal story. I agree that it's fascinating to think of what would have happened if Lynch had been able to delay the killer's reveal. Would it have been like The Killing where so many viewers just quit after there was no reveal at the end of Season 1? This makes me even more curious to see what happens with the new episodes on Showtime. How will they feel? It's dangerous to get our expectations too high, but how can we not? Well, to be honest we don't have to wonder because the fact that he waited as long as he did was already enough to turn off most viewers! By the time Laura's killer was revealed the ratings were really suffering (although they did spike for that announcement) and the critics had turned on the show about a month earlier, with the season 2 premiere. My feeling is Twin Peaks was damned if it did, damned if it didn't. It was a miniseries at heart, overextended into a weekly TV series. But as noted above, I'm glad that mistake was made because if it resulted in a lot of flaws, it also resulted in the best parts of the whole experience. I'm glad 2016 will be a tight, compact, focused Lynch-Frost limited series. But I'm also glad they experimented with a straight-up TV show format in 1990.